On the outer top of the shoulder the collar bone is held down by several strong ligaments to a bone called the Acromion. This small yet important joint is known as the AC joint. The AC joint is usually injured by falling onto the outer point of the shoulder or a direct hit such as a rugby side on hit. The medical world tends to grade AC joint injuries into Grades 1-3. 1 being a “strain” of the ligaments and joint capsule, and 3 being a fairly significant tear of the ligaments holding the collar bone down. Grade I and II AC joint injuries, although quite painful and debilitating for some 4-6 weeks, usually heal and get back to full movement and strength if the correct exercises are followed. Generally speaking for a grade III, if both AC joint ligaments have been injured then an opinion with an orthopaedic shoulder specialist would be strongly advised, especially if the injury is to your dominant side. In these instances a clear ‘step’ deformity is visible just above the deltoid muscle on the outside of the shoulder. Surgery can be performed to hold the collar bone down, but most specialists will do this predominantly to reduce the deformity or lump, not so much for function. They can take some 6-12 mths to recover yet most patients report a full recovery from an A/C joint injury. In more rare incidences, there can be damage to the bone or underlying nerves and blood vessels, these do often need Orthopaedic consultation and possible surgery. suitable management plan to assist recovery . 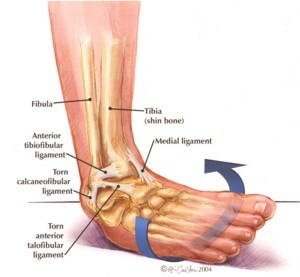 Ankle rehabilitation – to tape or not to tape when returning to play?